Back in 1998 when I started Design Hovie Studios in Ballard, I was shocked at how many cool yet unnoticed businesses there were in the neighborhood. Then, one day I had an idea... why not make a site that showcased all these great Ballard businesses? Now remember, this was 1998 and, although common now, these types of sites were very unusual. So uncommon in fact that even though I tried, I couldn't get businesses to fully comprehend what I wanted to do and chip in to pay for the site. After a couple of months of pitching to no avail, I finally went ahead and made the site, inballard.com, on my own dime and went about placing various Ballard businesses that I thought were "cool" on the site. Year after year I continued to tinker and tweak the site all the time adding new Ballard businesses. The site grew in visitors and prominence and was listed on many travel sites throughout the world as the reference for the Ballard area. Ballard merchants began to notice and I became very busy doing design work for these businesses. In addition, I was able to do sites for the Ballard Chamber of Commerce and for the Edmonds Chamber of Commerce as a direct result of inballard.com. This went on for over 10 years until in the Spring of 2009 I was contacted by a group of Ballard merchants who wanted to do something to drive more shoppers to the Ballard area. 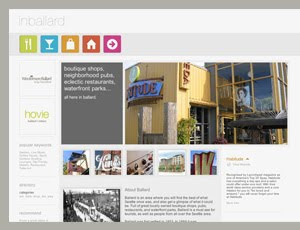 After a couple of meetings tossing around various ideas, it was decided that the group would use inballard.com and the In Ballard theme to create the Summer, Tuesdays in Ballard campaign. Together we pitched the idea to a group of over 50 Ballard merchants. The idea was so well received that we pulled together over 70 merchants who all chipped in to fund the Tuesdays in Ballard campaign. The campaign was a great success and even was named the year's best by Seattle Magazine! My little Ballard site has finally grown up and is now the official site of the newly formed In Ballard Merchants Association. It's helping to pull together local Ballard merchants and drive more shoppers to the neighborhood. Exactly what I had hoped it would do over 11 years ago!